This is an important book, not least because it presents a view for reason which has been censored in many countries. The author begins by saying that his three previous books, in different genre, were published eagerly by British publishers, but that this latest book was flatly rejected by every British publisher even with the promotion of an outstanding literary agent. His experience has been shared by others who have found difficulty in being published on political and economic subjects in Britain, where their unfashionable views and conclusions have later proved to be well-founded. It is therefore fortunate that the author continued his search for a publisher with determination. Peter Mayer, the proprietor of The Overlook Press in New York, is to be thanked for having the courage to stand against a new and intolerant fundamentalist faith by publishing “An Appeal To Reason” through the old-established London publishing house, which he also owns. The Church of Global Warming will undoubtedly rage against a very well-reasoned book and may claim that the father of a television cook is hardly qualified to write on the subject, and that his heretical views should be ignored by all sane people. Of course the author is very well qualified to write on the subject and to hold a view. As an intelligent human he is able to read work from others on the subject, conduct his own research and to form an opinion. He is entitled to ask questions when the Church of Global Warming makes generalized and unsubstantiated claims in the hope that no one will notice their inaccuracies. Nigel Lawson also has other qualifications. He was a journalist before he entered Parliament as a British MP in 1974, and he served with distinction in the Thatcher Government that did so much to turn around a moribund British economy and fight off the forces of intolerant national socialism at home and abroad. That service included a period from 1983 as Chancellor of the Exchequer, turning the British economy from a sad basket case into an expanding and well-structured financial force on the world stage, a skill set sorely lacking in the present Government under “Bottler” Brown. 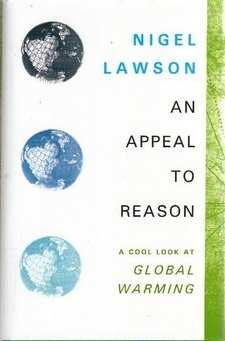 Nigel Lawson was created a Lord in 1992 and has served in the House of Lords with distinction as a member of the Lord’s Select Committee on Economic Affairs, which in 2005 produced a significant report on “The Economics of Climate Change”. All of that experience stands behind his latest book. He has employed journalistic skill to produce a hard-hitting response to the new faith of Global warming with its propaganda and scare-mongering. To achieve this, he has carefully and succinctly examined all aspects of the global warming issue. He has assembled facts and provided an extensive set of notes and bibliography, hiding nothing. The reader is therefore able to read this factual and reasoned review, look carefully at the notes and refer to titles from the bibliography, deciding for him or herself whether to agree fully or in part with the conclusions reached by the author.